As the primary food and farming legislation, the Farm Bill has immense and far-reaching impact. With billions of dollars in subsidies at stake, reforming the 2012 Farm Bill to support healthy foods and healthy food systems is one of the most important steps in taking a stand for nutritious foods and sustainable farming. An overwhelming majority of the government funds support large agribusiness corporations over "farmers" in the traditional sense. The Farm Bill provides massive funding for Concentrated Animal Feeding Operations (CAFOs), more commonly known as factory farms. Commodity subsidies for animal feed, especially soy and corn, are the most obvious handouts, but the conservation title also provides direct funding for environmental clean-up. 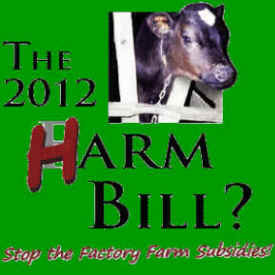 Thus tax-payers shoulder the burden instead of the agribusiness corporations that produce it. Nutrition with 67% -- comprising food stamps, school lunches, and related programs. Commodities with 15% -- heavily subsidizing animal feed and giving unfair advantages factory farms. Furthermore, commodity crops are heavily used in processed foods which deflates their price to the disadvantage of fruits, vegetables and other fresh, whole foods. To further exacerbate the problem, fruits and vegetables are considered "specialty crops" and receive very little support. Conservation with 9% -- using public taxes to clean-up after factory farms instead of making the agribusiness corporations pay for their pollution and crop insurance with 8%.